Can a family member help you come up with the down payment for a mortgage? If so, are there any limits on how much they can provide or other restrictions? The answer is yes, in both cases. In today’s economy, many potential home buyers, young people in particular, are looking to their parents or other relatives for help in coming up with money for a down payment. A larger down payment can make it easier to get a mortgage, make it possible to get a larger mortgage than you would otherwise have qualified for, or reduce the interest rate on your home loan, so there are a lot of benefits to using gift money for a down payment. There are certain limitations, however, so you want to be aware of them before you get started. Do all lenders allow gift money for a down payment? In most cases, it’s ok with lenders to use gift money from a family member to make a down payment. The FHA allows down payments of as little as 3.5 percent, and all of it can come from a gift, while Fannie Mae, VA and USDA Rural Development allow down payments fully funded by gift money as well. If you’re getting a mortgage backed by Freddie Mac, however, you need to put up at least 5 percent of the purchase price out of your own money if the down payment is less than 20 percent. However, you can use gift money to increase your down payment, perhaps doubling it to 10 percent for example, and you can use gift money for the whole thing if you’re putting up 20 percent or more. 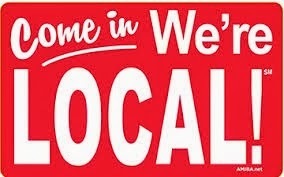 One problem is that, when getting a conforming loan, you rarely know up front if your lender plans to sell your loan to Freddie Mac or its sibling, Fannie Mae. So if you’re planning to use all gift money for your down payment, try to find a lender who deals primary with Fannie Mae, unless you’re applying for an FHA, VA or USDA loan. Can you borrow down payment money from relatives? In a word – no. 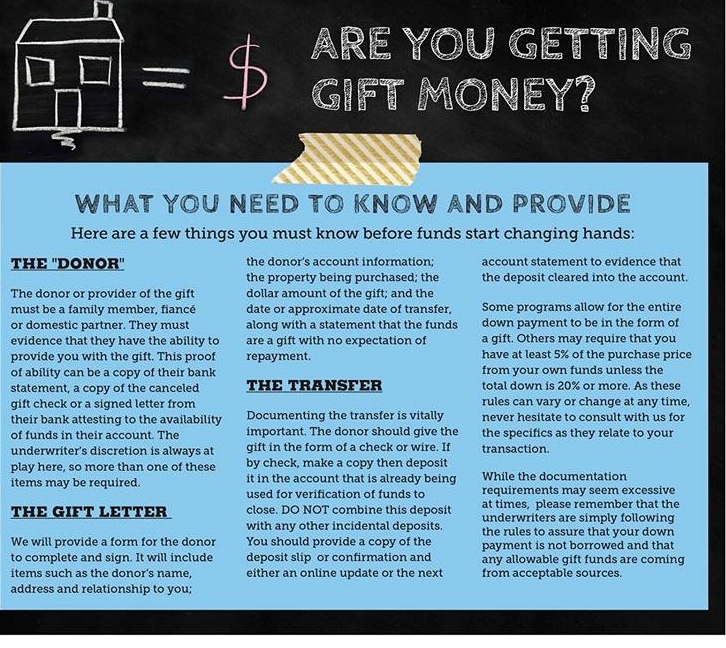 In fact, when putting up gift money for a down payment, you need to provide a statement from the giver that the money does not need to be repaid. The reason for this is that your down payment is supposed to be your own money, free and clear, with no strings attached. If it has to be repaid, even to a relative, that increases your debt burden and affects how much a mortgage lender is willing to lend you. How much can they give you? As much as they want or are able to. However, in practical terms, most gifts are limited to $13,000 – that’s how much the IRS allows one person to give another each year without incurring the gift tax. That amount doubles to $26,000 if the gift is given to you and your spouse, and can even increase to $52,000 a year if your parents file their taxes separately and each give gifts to you and your spouse. The gift tax isn’t something you pay as a recipient – the gift is tax-free to you. From the IRS’ perspective, gifts are a form of early inheritance, so any amount above the $13,000 annual individual limit (up to $5 million lifetime) is taxed on the giver, same as an estate tax would be. That’s also why the gift isn’t tax deductable for the giver, since it’s considered an early payout from their estate. If you’re fortunate enough to have family members who are able and willing to help you financially, gift money for a down payment can be a big help in buying a home. However, just make sure you know the rules going in so you don’t run into problems during the process.